Remember back in the beginning of December, when we brought you part one and part two of only some of the Windows Phone Emoji to be found in the operating system? 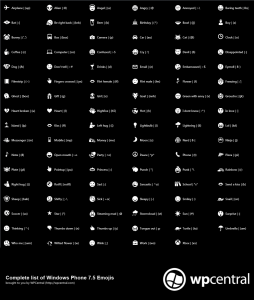 Well, whether you remember or not, WPCentral did some sniffing around on the Windows Phone operating system with determination to find all the Emoji goodness. Find it all they did indeed. 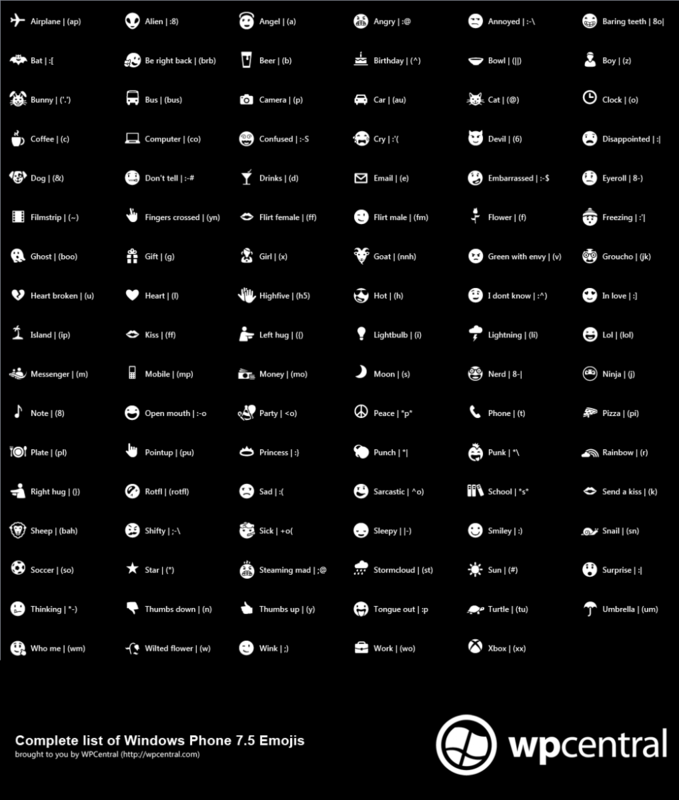 Not only did they find all of the commands for every single Emoji included in the Windows Phone OS, but they compiled it all into a nice and easy to use image. We remind you however, that some Emoji do have multiple commands to bring up certain ones so be careful what exclamation points and punctuations you put together accidentally, it might just sent the wrong Emoji. For example, as you can see in the list below (continue reading) you can call up a heart Emoji with the command (l) but many users have long known that sending the command <3 will also call up the heart Emoji. An easy way to have access to this list is to upload it to your SkyDrive, or directly to your Windows Phone, and you will always have access to all the commands. Our hope is that in a future update Microsoft will simply add all the Emoji icons to the keyboard for easy call-up.